My first brush with fine printing came during college when Robert Whitaker introduced me to the work of Roy A. Squires. Shortly thereafter I was seduced by Lewis Allen's influential book Printing with the Handpress. In the intervening decades I was occasionally able acquire equipment and to do a little letterpress printing; but it was in 2003 that the press of my dreams, a Washington handpress manufactured by Morgans & Wilcox, arrived at Burke Street, courtesy of Mike Peich and his Aralia Press. We are currently (late 2014) binding copies of the third book from the press, Three Lectures by Fritz Eberhardt. 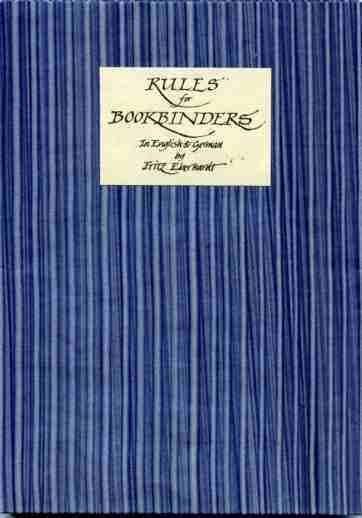 The first title, Rules for Bookbinders, also by Fritz Eberhardt, is now sold out and the second, a catalog of Loyd Haberly's bookbinding tools is down to a few regular copies. In the upcoming year the Press has two titles scheduled: a sample book of East German wrapping papers collected by and with text written by the late friend of the Press Dr. James Fraser; and a letterpress edition of Peter Verheyen's translation of Ernst Collin's 1922 dialog between a bookbinder and his client, The Bone-Folder. Peter and I are most fortunate to have been permitted by Sibylle Fraser to utilize photographs taken by Hans Schiff at the Bremer Presse bindery in the mid 1930's for illustrations. The images will be contact printed at full size from scans of the original negatives. 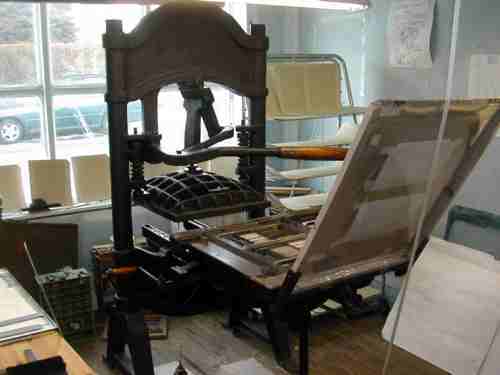 Consists of three working presses: a 20"x 25" Washington, a 6" x 10" Kelsey Model X and an Adana Horizontal Quarto. We also have a Vandercook Model 099 proof press and a Wesel galley proof press. In September of 2007 we acquired a Poco proof press in need of restoration along with over 100 typecases, one double and three single dustless type banks. And in 2009, through the good offices of Rob Lilley we received the donation of a Damon & Pets 8 x 12 treadle clamshell. which is also (still!) waiting for restoration. Our types include 18 point Dante Roman from Michael Bixler, and a good run of Italian Old Style roman & italic from 14 to 36 point; smaller amounts of Palatino, Optima, Bodoni, Franklin Gothic, Emerson; some interesting sans serif wood faces. The Press also utilizes Boxcar bases for working with polymer plates. As noted above, the press is in the preliminary stages of Einschlagpapier and The Bone-Folder. Progress on these upcoming editions will be documented here and on the blog. s t a n d i n g o r d e r s Standing order customers have the benefits of first acceptance of all new titles, a twenty percent discount and free shipping. There are currently 8 standing orders. d e a l e r s Dealer discount is thirty percent. Anyone interested in books from the press is invited to contact us. Payment can be made by check, Mastercard, Visa, Discover, or American Express. We don't make Artists' Books; our goal instead is to make Bookbinders' Books, Printers' Books and, most of all, Readers' Books.